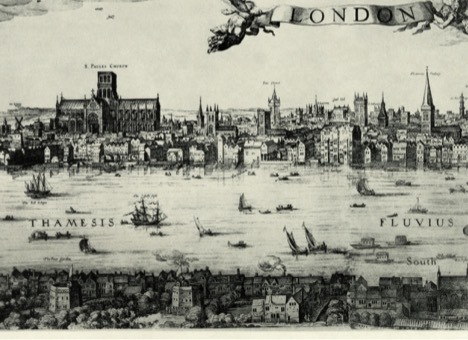 Detail from the panorama of London by Claes Visscher (1616). Image courtesy of Wikipedia. The shop down the road that sells alcoholic drinks offers such a variety of beers and ales that while shopping I sometimes imagine myself newly arrived from a communist planned economy into some bewilderingly choice-laden consumer paradise. Beer made in ever-so-small batches by Belgian monks, or by siblings in post-industrial Chicago, or wacky young guys working out of a garage in rural Oregon – all compete to position themselves as small-scale and artisanal, sharing nothing with the huge conglomerates that offer cheap prices but little taste. Such producers, as well as the growing numbers of home brewers, suggest that drinkers increasingly value the idea that beer should be a carefully-crafted product, something that connects us to a bygone (and yet recoverable) age of natural foods and careful cooking. As much as I applaud this shift in taste and values, as a historian I smile at the association between beer brewing and simpler modes of making food and drink. This is because four hundred years ago in England the beer brewers of London operated businesses that helped inaugurate a modern world of environmentally-damaging industrial production. London, already during the reign of Elizabeth I and the career of Shakespeare, burned huge amounts of polluting mineral coal, and no one burned more of it than brewers. Hell, according to 17th-century English authors, was like the smoke emitted from a brewhouse chimney. But exactly how much Newcastle coal would be required to brew varied enormously, according to factors including the brewer’s preferred recipe and method, the kind of drink being prepared, and, in all likelihood, the brewer’s skill in conserving expensive fuel. One 18th-century expert on brewing, Michael Combrune, explained that brewers disagreed regarding how long to boil the wort, with preferences ranging from 5 minutes to 2 hours, concluding that experience and careful observation were the best guides. Once the hops were added, a further boil of 2-3 times the first was necessary. In general, he found, 6-7 hours of boiling was typical, but the entire discussion seems to be as much prescriptive and descriptive, a guide to what brewers ought to do. 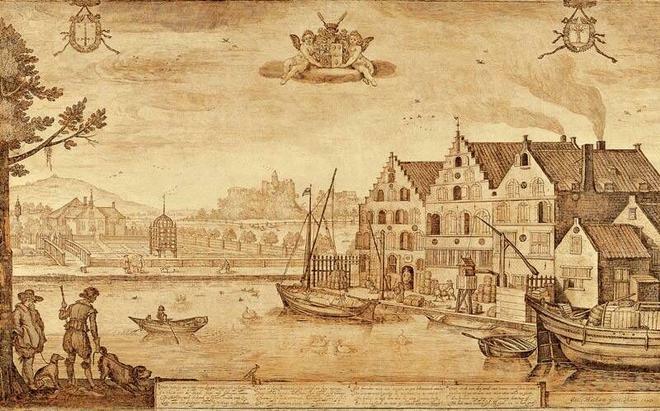 Jacob Adriaensz Matham, “View of the De Drie Leliën Brewery at Haarlem and of Velserend Manor, Owned by Johan Claesz van Loo” (1627). Image courtesy of the Frans Hals Museum, Haarlem. Given this variety, it is no wonder that different brewers required different inputs of energy. The detailed records of the brewery within Westminster College, part of the complex surrounding Westminster Abbey, shows that in the decades around 1600 they were able to brew about 30 barrels of beer per ton of coal. But in 1592 when the Brewers Company explained to the crown how much grain and fuel they required, their numbers suggest a ratio of about 3 times as much. In the mid-18th century the brewhouse for Corpus Christi College in Cambridge made only about 25 barrels per ton, while at the end of the century the huge commercial brewhouse of Truman and Hanbury in London made almost 80. Economies of scale must have mattered a great deal here; Truman’s produced more than 1000 times more beer than Corpus, and spent around £2000 per year on 1400 tons of coal during the 1790s. A business like that would have had both the experience and a powerful motivation to economize on fuel consumption. But even 200 years earlier some London brewers used around 500 tons per year, or 1-2 cubic meters of coal burned in a day’s brewing. Brewing, already in the 16th century, was undertaken by ambitious business people who employed dozens of workers and used a great deal of energy. This is explored in my new book, The Smoke of London: Energy and Environment in the Early Modern City (Cambridge: Cambridge University Press, 2016). For detailed calculations on industrial burning, see also William M. Cavert, “Industrial Fuel Consumption in Early Modern London” Urban History (2016), available here on FirstView. Michael Combrune, The Theory and Practice of Brewing (London, 1762), 186-88. Westminster Abbey Muniments 33,906-33,063, Abbey Stewards’ Accounts. Corpus Christi College Cambridge Archives CCCC/O2/2/71; London Metropolitan Archives B/THB/B/150-1. William M. Cavert teaches early modern English, environmental, and world history at the University of St. Thomas in St. Paul, MN. He is the author of The Smoke of London: Energy and Environment in the Early Modern City (Cambridge University Press, 2016). Besides urban and environmental history, he has recently turned his attention toward England during the Little Ice Age.